Sunday brunch and crunchy waffles sounds so perrrrrfect!!! Freshly made waffles with its flat shape and deep square divots echoing to be filled with toppings and loaded them with more and more flavors. Yum!!! I am drooling over these beauties. In a food processor combine spinach and dates and grind coarsely. In a mixing bowl combine oats flour, baking powder and salt and mix properly. In another bowl whip the egg whites properly until foamy. Add vanilla extract and spinach mix to it and whip again until well blended. Now add milk to the batter and mix very well. Let it rest for few minutes. In the meantime preheat your waffle iron and grease it well. Now fold in chocolate chips to the waffle batter and pour ½ cup of the batter in the middle of the waffle iron. Spread equally with heat proof spatula. Now cover the waffle with the flip and let it cook until golden brown. Serve warm with more chocolate chips on it and your favorite fruits. (If desired you may pour maple syrup on the waffle for sweeter taste). I used nonstick waffle iron with a flap. Make sure to follow manufacturer instructions of your waffle iron before baking waffles. This recipe yields 6 inches 5 round waffles and serving size is half of the whole round waffle. This looks so yummy! I love your healthy take on it. Would the recipe change much if I didn’t add the dates? Thank you Leanna. The recipe wouldn’t change at all. I add dates due to its high potassium content which I personally feel is better than sugar and thereby increase the nutrition of these waffles. Feel free to add your choice of sweetener. 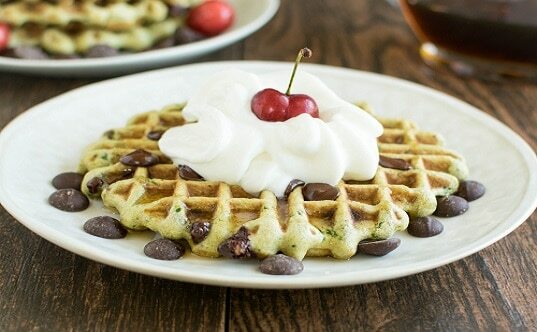 I would never think to put spinach in my waffles, but this looks amazing! Thanks for sharing! Look at all that chocolate! I am going to do this, it’ll be a good way to get more greens into my kids! Genius! I’m always trying to fit more veggie’s into my diet so these spinach waffles would be great. Thanks!! I dont have a waffle iron, wondering if you could make these u as pancakes…. and maybe do part baby kale part spinach I love your recipe as is, just trying to adjust to what I have in house right now Thanks! I definitely need to try this for my sweet-toothed kids! I love the idea of spinach in waffles and think I’ll try it Sunday morning. I wouldn’t have thought of it on my own. Thank you for stopping in at my blog today. It’s always nice to meet other bloggers who love food and cooking. Thanks for sharing ur wonderful and healthy recipes with us. I want to try this recipe. What can i substitute for egg ? Also can i replace oat flour with whole wheat or millet flour?